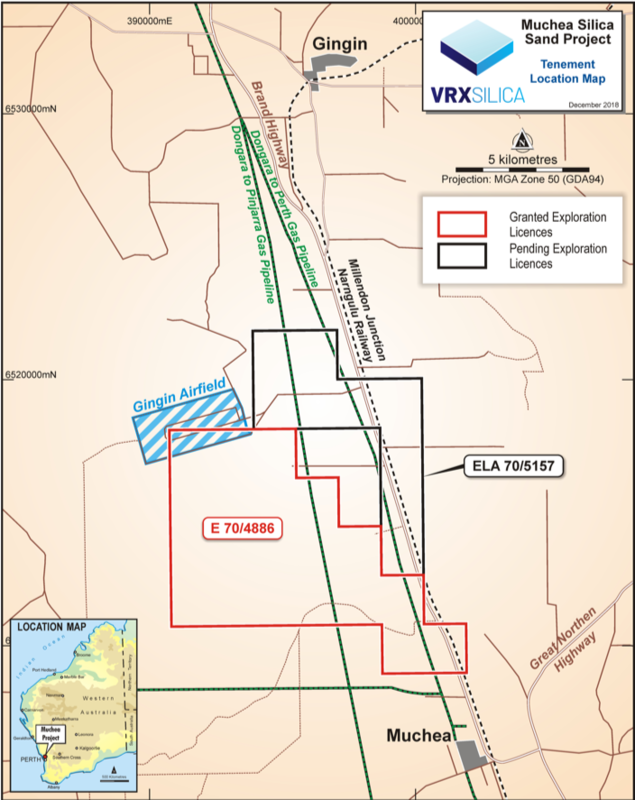 VRX Silica’s Muchea Silica Sand Project is situated 50km north of Perth and is strategically located adjacent to the Brand Highway and a rail connection to the Kwinana Port, which is suitable for bulk shipping. It comprises two tenements with an area of 93km². VRX Silica has announced a maiden Mineral Resource Estimate (MRE) for the Muchea Project, prepared by independent consulting firm CSA Global. It comprises a combined total of Indicated and Inferred Mineral Resources of 191Mt @ 99.6% SiO2 reported in accordance with the JORC Code 2012 Edition. The Indicated component comprises 19Mt @ 99.7% SiO2, with the Inferred component 172Mt @ 99.6% SiO2. The estimate was based on 44 hand auger drill holes for 260.7m and 46 aircore holes for 522m and defines the upper white silica sand layer. VRX Silica believes that the maiden Mineral Resource Estimate has confirmed that the project is a world-class and high-grade deposit, which can be processed to supply almost any grade of sand for glassmaking in Asia. The Company intends to drill additional infill holes in and around the Indicated Mineral Resource area early in 2019 to increase the amount of Indicated Mineral Resource for inclusion into a mine plan. The Company will move quickly into detailed engineering and mining studies to support mining proposals for relevant government agencies to commence the approvals process. Process circuit design and engineering will then follow, allowing for capital cost estimates to be generated. The VRX Silica board possesses a wide range of technical and corporate skills and the appropriate management and technical experience to manage the planned exploration programs at Arrowsmith and Muchea and to take them through to production and export sales.